Juan Santamaria International Airport (SJO), is near the capital of Costa Rica, San Jose. Daniel Oduber International Airport (LIR), is in Liberia. We strongly encourage, and will be happy to help you arrange the "Fastest & Easiest" option as it leaves the least amount for error. Sansa Air (http://www.flysansa.com/) offers 30 minute flight from SJO or LIR to the Tambor Airport (TMU), 45 mins. from Cabuya. Be sure to tack on the additional $25 shuttle to Wild Sun Jungle Resort when you buy your flight. Taxis may also be available for $55. Nature Air is no longer recommended as they are having financial difficulties as a company since early 2018. We recommend that you arrive at least 2 hours before your connecting domestic flight. All year: Chartered afternoon shuttle from SJO Airport or San Jose - $270 ($230 if willing to change vans at ferry dock) for the first 4 people plus $10 extra per additional person. All year: Private shuttles can be arranged at any time for $250 for 1-4 passengers +$15 per persons 5-11. A good option for flights arriving on Friday afternoon/evening. If planning to take the bus, you'll need at least 3 hours between your international flight arrival and the public bus departure. With this option, you must first take a public bus ($1) or official (red or orange color) taxi (approx. $25) from the SJO airport to the bus station: "la terminal 7-10 (siete-diez)" located at "Avenidas 7 y Calle 8, Contiguo al antiguo cine Libano". From there, you will take the escalator to the 2ndd floor to buy tickets for the bus headed to Cobano, Mal Pais, Santa Teresa and Montezuma. You will be making a stop in Puntarenas to hop on the ferry. After enjoying the views of the Gulf of Nicoya from the upper deck, your bus will meet you on the other side to bring you to Montezuma. Stay on your toes because you will have to change buses in Cobano for Montezuma. Once in Montezuma, take the 12:15pm or 4:15pm bus to Cabuya or, if arriving later, take a taxi ($14). There is no bus service from Liberia to Cabuya. It's possible to find a taxi any time you land to reach us within 6 hours. A door to door taxi from the airport will cost $250 one way. Another option is to take a $100 taxi to the ferry and meet another taxi for $70 on the other side which we can arrange for you, or the $3 bus which awaits every ferry. If you don't mind carrying your luggage on the ferry, this is a better budget option. Sansa and Nature Air run commuter flights from TMU ($50, 45 min. taxi from Cabuya) and take approximately 25 minutes. To LIR, regular shuttles leave Cabuya at 6am and 8am and arrive around 11am and 1pm respectively, for $65 per person. Private shuttles are available on your schedule for $230 for the first 4 passengers and $15 for each additional person up to 11. To San Jose, follow signs out of Cabuya towards Cobano, Tambor and Paquera. 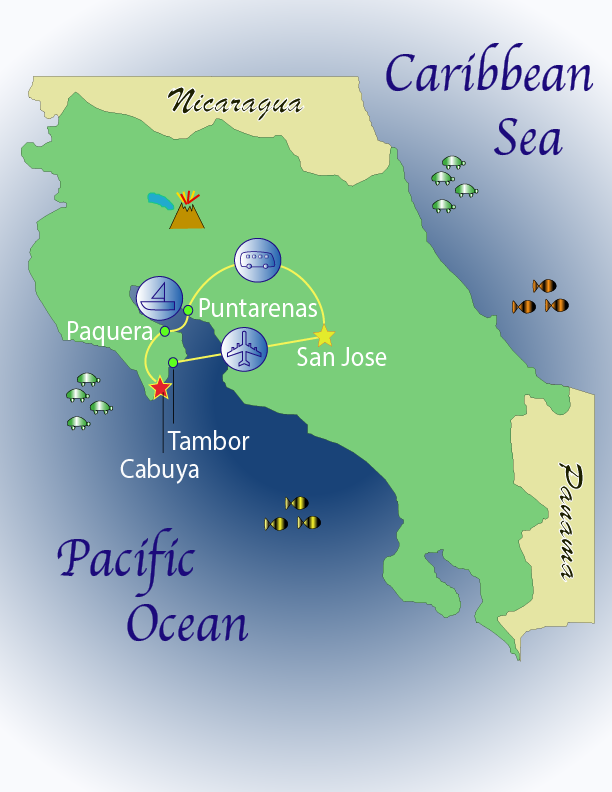 Take the ferry to Puntarenas and continue driving towards Caldera, then San Jose. Be very careful to follow signs. To Liberia, follow signs to Montezuma, then Cobano, Paquera, Naranjo, Jicaral, Nicoya and finally Liberia.